Armed with a press pass and my camera I climbed to the roof of the hotel with hopes of grabbing some shots of the amazing scene that is Carnival. However, when I reached the top my eyes gazed downward at a divide as obvious as the lines of a child’s colouring book. A ring of black men and women work hard to control a rope serving as the divider between those who have paid to enter a “bloco” and those who haven’t. My eyes begin to scan the “in” crowd searching for any sign of a person of colour beyond the coco Brazilian tan. To my disappointment I finally spot someone, selling beer from a cooler over his head. But as the music blares through the loud speakers and bodies gyrated to the deep rhythms of Samba music, no one seemed to notice. Salvador da Bahia was one of the first destination points for slaves brought to the Americas. Its history is about as deeply seeded in the slave trade as any on the planet. Although the slave trade may receive the most attention in North America, it was actually here in South America and the Caribbean where a vast majority of slaves were brought. The north-east of Brazil became the home for the middle point of the Colombian exchange which sent finished products to Africa, slaves to the Americas and raw goods from back to Europe from the Americas. In Northern Brazil, slaves were put to work growing crops such as sugar, tobacco, and cassava in the hot sun. Obviously, Slavador da Bahia will forever hold its own place in the history of one of the most terrible acts of human kind. So much so, in fact, that many feel that the sentiments of race still persists to this day. I recall a conversation I had with a women in the bus in the south of Brazil about a month before Carnival. She told me of her visit to Canada a couple of years ago. 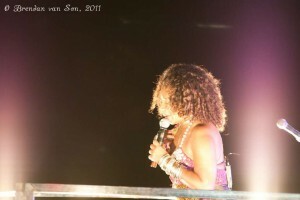 She said in a very matter-of-fact tone that she “liked the white people in Canada, they were nice.” The sentence alone drove home the point she was trying to make, but she furthered her point with her follow-up statement that “in Brazil white people hate black people.” A statement so strong that it wrenched my stomach. Hate. I’m sure white people don’t hate black people, but after the hundreds of years of sharing the rich lands of Brazil, does a separation still exist? Could hate based on skin colour possibly still exist? In a free country? As I continued to watch the proceedings of Carnival, and as the various parades made their way towards me I tried to let my soul dance along with the music, but my mind couldn’t help but immerse itself in the presence of what appeared to me as racial segregation. I look down from my perch at those selling water, beer and snacks from fabricated mobile stands and can’t help but realize that they are all dark skinned. Another bloco begins to make its way towards me and I look down at the dividing ropes protecting those who have paid to be inside. Those inside are mainly Caucasian and those dragging the rope are nearly entirely all, again, dark skinned. I can’t help but think for a short time of the irony that it seems as if the dark skinned rope men and women seem to be holding back their “own people” from entering. A little later on a bloco passes through of nearly all dark skinned people. Yes it’s true that in Canada those of a differing backgrounds have different musical tastes, but not so much so that there is a finely drawn line in black and white. I watch the group dynamics work their way out even beyond the ropes as the night goes on, in hopes that the racial divide of the blocos is music taste related, However, I continue to be startled and disappointed by what I see. Groups of white people and groups of black people seem to adherently stick together, the sight of a mixed racial group is beyond a rarity, it is an anomaly. I soon begin to hate the ropes of the blocos. I begin to blame the ropes for creating a societal divide. I begin to resent the idea that carnival, in all its glory, could possibly be a stage for racial divide. This is supposed to be a moment when a country joins to celebrates its history, culture, and most of all its ability to come together. In the end it seems that it may be pulling it apart. I am given hope late in the night as a concert goes by without a following bloco, people without defining t-shirts or skin colours follow along singing and dancing. I can’t help but feel proud for the entertainer who has obviously turned down a significant amount of income by traveling without an entourage (to enter a bloco can cost between 100-300USD). To talk about such issues is difficult because there is no easy solution, and no easy transition to progress. And to write about the issues are even more difficult, it is like teaching a math problem without knowing the solution or how to get there. However, as people carried their way through Carnival turning the blind eyes to the racial roles being acted out in front of them I couldn’t remain blind, I couldn’t remain deaf to the situation, and I certainly could not remain silent. As a writer, as a journalist, as a member of human kind I feel that it is my duty to open a stream of dialogue and a platform of discussion for things that I see as detrimental to the human community. In writing this article, I hope not to solve an issue which is obviously seeded in the very fabric of society, I simply hope to create a platform of discussion. It is in this level of dialogue where I hope we can come together, talk, listen, learn and, hopefully, begin to understand what draws us apart so we can begin to come together. Although travelers are usually not experts in the countries that we visit; we sometimes are more perceptive to conditions than someone that lives there. Alexis De Toqueville and V.S. Naipul both wrote very interesting books about America when they traveled here. Sometimes the observations can be harsh criticisms. It is thought provoking for the natives to read these works to see how an outsider views them. I must admit that through my travels i can say that I have noticed the same thing but you also have to remember the places you are visiting. People are also wanting to make money and the people who are usually paying are the visitors. You’re right that that is usually the case. 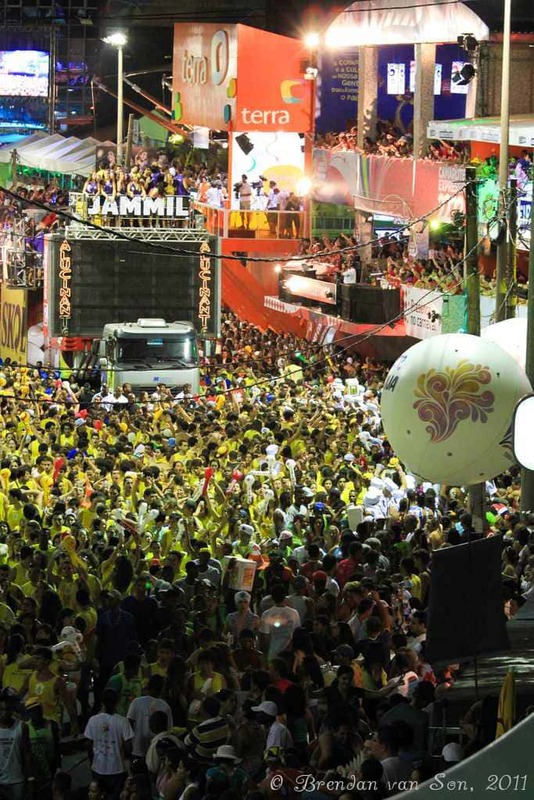 In Salvador’s Carnival, however, that is not the case. Those who are paying a Brazilians. 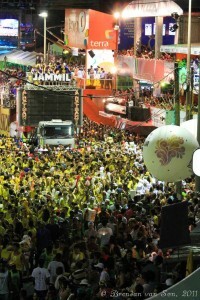 Salvador Carnival is Brazilian Carnival. The divide between light and dark skinned has nothing to do with visitors and everything to do with race divide within brazil. i know that i am late coming to your article but i really did enjoy that you brought this issue to light. as a black american studying in brazil- i was stunned by brazil’s brand of unabashed racism. Many in Brazil say that as American’s we impose our norms onto their society and consequently see it as racist. The truth is that it is highly segregated. Generally speaking those with privilege and access are lighter skinned and those that do not are darker skinned. Of course there are exceptions. People treat you accordingly. And the privileged in Brazil do not have to sugarcoat their disdain of the poor. It’s ugly. That being said- I love lots of things about Brazil and have been there five times. But it is a racist country as are most places that are dealing with a slave past. thank you for this article. Yes, at first you love the mixed culture and diversity and then you realize there is separation. I’ll be honest in saying that I saw this separation more in the North than the south. When one feels powerless, they begin to resent that fact, yet feel as if there is nothing that can be done to change it. So, eventually acceptance sets in and the powerless begin to feel disdain for being relegated to that station in life. Consequently, they will begin to resent the idea of said powerlessness and those who fall into that category (including themselves). It is easier to react against someone who is as powerless as you than to go against those who is perceived to be powerful. That is why the people holding the rope were diligent about keeping the other powerless people out. They have ‘learned’ that the powerful must be protected at all costs even if there is nothing to be protected from. They are victims of a type of Stockholm syndrome that makes it ok to perpetuate their own victimhood. They have fully immersed themselves into believing one group is superior to the other and do not recognize the irony of themselves feeding the racial monster. The psychological ramifications are staggering. If you are told from day one that you are less than, you would have to have the intestinal fortitude of ten men to be able to shake that indoctrination off. Helplessness is learned and until someone rises up and challenges the status quo…..this is what you will continue to see. Thanks for another brilliant piece, Brendan. I have to stand up for the Brazilians and say that they are overall not a racist society! The opinion expressed by the woman from the south of Brazil (that black Brazilians are hated in Brazil) is absolutely NOT true of most Brazilians’ thinking. I was shocked to read her statement. Most Brazilians are mixed race, there are actually not many “white” people there except for in the very south, and mixing of races has been acceptable for a very long time and began with the Portuguese settlers and African slaves. You probably saw a lot of black women on the floats at Carnaval– black women are the accepted standard of beauty there. Most Brazilians say that race really isn’t an issue there…What is more true is that it is a society based on class, not race. This is reflected in the enormous separation of wealth, the existence of haves and have nots (many of whom are black). Of course, it is very complicated, but any separation you may see in Brazil is not a result of racist segregation. Those people on the other side of the rope were probably wealthy, lighter-skinned rich people from other parts of Brazil. I agree Jenna, my point is not that Brazilians are racist. As you probably read, my point is that a huge racial divide exists maybe from north to south, or perhaps in a class situation. For me, carnival showed a huge class divide between those who are dark and those who are light skinned. The Brazilians love talking about how they are a mixed culture, and I love that. But there is no denying that there is enormous disparities and divides in the country’s wealth, race, and social classes. did you experience brazil as a black or dark-skinned person? I just wanted to add to what you said about the slave trade and Brazil. Brazil actually had by far the largest number of slaves coming from Africa. There is a great museum in Sao Paulo (Museum of Afro-Brazil) that explores this history. Did you see any kind of museum or monument remembering slavery in Salvador? Also, because Brazil never had the overt segregation that existed in the U.S., it is hard for many Brazilians to see how racism has operated in its society. Because the north/northeast of Brazil is the poorest part and also has the most blacks, race and poverty often go hand in hand, unfortunately. Yes, you’re right that segregation, in my opinion, has always been mote hidden. The Afro-Brazilian museum in Sao Paolo is brilliant, I would recommend anyone going to Brazil to check out that museum, absolutely brilliant. With all due respect, it is very easy for those who have never experienced a particular thing to say it doesn’t exist. That woman’s statement was her reality despite what others would try to make of it. I think it’s patronizing to presume that you could know her truth. I think she would argue though we may all have the blues, yours is not like mine. If the society is truly based on class and not race, it begs the question why the have-nots fall into this category: “many of whom are black”? I think we take a head in the sand approach when we emphatically deny the existence of something that would in effect disenfranchise a group that you would never be a part of nor feel the effects of that evil. I think it would be more beneficial to delve into this issue and learn why this woman felt this way instead of dismissing her comments. If we want to begin to get beyond and heal the wounds of racism and eradicate it, we have to first acknowledge its existence. I actually just learned about the slave trade in Africa this month – the country has such an interesting and difficult history (like most South American countries, I suppose), it’s made me want to visit there someday even more. I’m sad to know that the country is still not integrated though. Wow, it’s quite a week for race-related blog posts. Earlier this week, I wrote about certain difficult aspects of traveling in India as a black woman (http://girlunstoppable.com/2011/04/17/indias-staring-culture/) and I saw another post yesterday about traveling as an interracial couple in South Africa. I definitely agree with you that it’s difficult to write about such topics and to be critical of countries we visit. There’s an underlying idea in travel writing that we should always be positive, but I think it’s important to discuss these topics that made us uncomfortable on the road and that might make readers uncomfortable. I agree with Ted Nelson that though it can be harsh, sometimes it’s good for people who live in a country to hear a traveler’s perspective. As far as Salvador goes, I actually spent a month and a half volunteering there. I wasn’t there for Carnaval, which much be a very different scene than everyday Salvador. 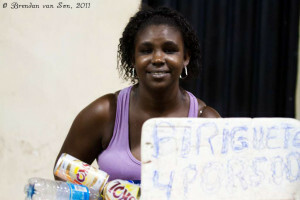 Almost all locals I encountered in Salvador were Native Brazilian, mixed or very African in their appearance. And I’ve actually never visited any other place where there was so much pride in African heritage, not even in Ghana which is where my family is from. Like anywhere else, there is still internalized racism and the socioeconomic disparity in Brazil is clearly linked to race. And the socioeconomic disparity creates the infamous crime in Brazil which probably has a lot to do with the “in Brazil white people hate black people” statement as well as the black people holding back other black people from entering. I hate the M.O. of making assumptions about a race rather than addressing what’s causing the problem. But based on my time in Salvador which was fantastic, I am surprised to read this! I’m guessing that Carnaval must create a different vibe there and that there are many people who come into Salvador from other places for it. Brendan, I agree about the Museo Afro-Brasil in Sao Paulo. Amazing. Renee, I found myself nodding my head while reading your reply to my comment despite the fact that you disagreed with my stance. You are absolutely right. At the same time, a person who reads this post with no experience in Brazil might think that the woman whom Brendan met reflects the population at large or that the kind of separation of races that Brendan saw is commonplace. You are correct that I should not dismiss her view, but because I have very strong ties to Brazil, including Brazilian family of all races, I am basing my view of Brazil on what I have experienced there first-hand for 11 years. 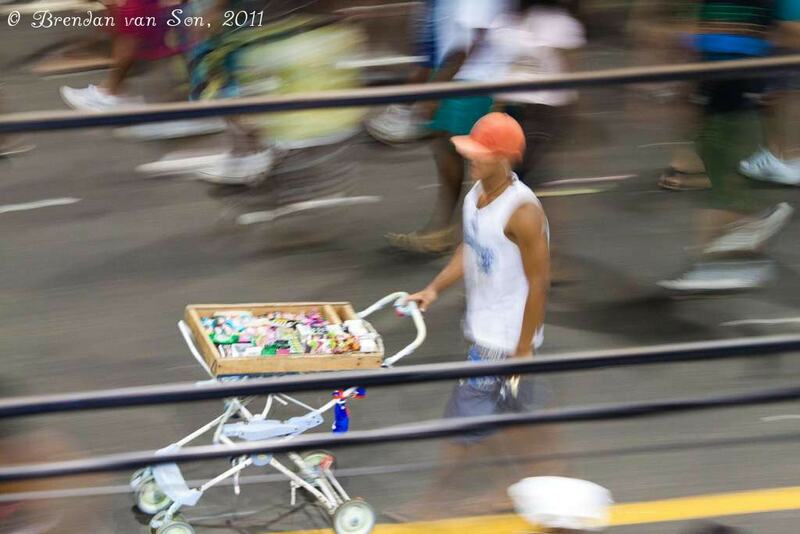 It’s true that most (not all) of poor people in Brazil are dark-skinned but there’s a reason. When the portuguese colonized Brazil they occupied the best and most fertile lands and enslaved the africans. Slavery was legally ended in 1888 and the white people just didn’t wanted blacks working for them (this is also the century in which many europeans came to live and work in Brazil). So the blacks were kind of excluded. Changing a little the subject .things in Brazil are quite weird…They say that the majority of brazilians are white but even in the southeast if you take a close look at people you’ll see that they’re not “pure” whites. Thanks for weighing in Fernanda, I was hoping to get a Brazilian perspective. I understand the history, and the reasons to it since I studied much of it in University, it’s a shame that even over 100 years later that separation in wealth still exists. And when I said Caucasian yes I meant pure, or at least mostly white people. And you’re right, the chances are they came from the South. The thing that amazed me though was that it wasn’t just one Bloco, it was nearly all of them. One bloco would pass nearly exclusively with white people, the following exclusively with black people, etc. It seems the division is more than just economic but social. I’ve lived in brazil, and although i agree with your stance on racism, i also kind of disagree. its more of a social class thing, not so much black and white. white people are generally wealthier, so they hang with other wealthy people. if a dark skinned brazilian were just as wealthy, he would be just as welcome. theres a stereotype as well that all dark skinned people are poor (which is some what true) and that whites are all rich. its so complex i cant even begin to explain it but i know very well how it is. I think that you’ve just proven my point Vinicus. How could race not be an issue in a county where “white people are rich and black people are poor”? Even if race is not the issue, when the distribution of wealth becomes (black and white) there will be an issue. From outside eyes I can see how complex the issue is in Brazil. As I stated before, I don’t think Brazilians are racists, I just think that there is a serious race issue. There are greater racial tensions in that country than any country I’ve ever been to before. I’ve just returned from Carnaval in Rio. While I notice the typical divide between the affluent white(r) people of European descent, I also saw a lot of mixed-raced couples and plenty of just plain brown people. Yes, Christopher. It’s a tough situation and of course we can’t lump a country’s sentiment into the statement of a few people. However, there is certainly a race issue in Brazil that needs addressing. I think pointing it out is the first step, so many people just seem to sweep it under the rug. You won’t see this in Rio! 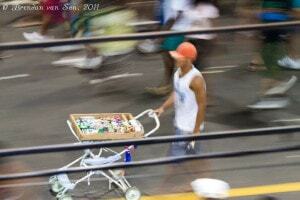 It happens in Salvador because there you have to buy the abadás to follow the blocos. In Rio it’s totally different, totally free, you don’t have to pay nothing. You just have to join and enjoy the party here!! There is no division!! !